I've been blogging since 2005, using various tools for publishing readable code. Originally you'd just put code out there, no colors, just a pre tag and some indention. Then 'export to html' became pretty standard in various editors, and everyone's life got better. These days, people want code examples available to play with - and I use GitHub to make that possible. I've been toying with different formats for sharing code, and my last blog entry demonstrates what I've settled on. I'll create a gh-pages index.html with the content of the blog entry, for people to review and provide feedback. Hopefully the extra integration with GitHub will make it easier to try out any code that I publish. As always, please drop me a line in the comments if you have any suggestions. Clojure stacktraces are not incredibly user friendly. Once I got used to the status quo, I forgot how much noise lives within a stacktrace; however, every so often a Clojure beginner will remind the community that stacktraces are a bit convoluted. You can blame the JWM, lack of prioritization from the Clojure community, or someone else if you wish, but the reality is - I don't expect stacktraces to change anytime soon. This blog entry is about separating the signal from the noise within a stacktrace. Let's start with a very simple example. Running (I'm using 'lein run') the above code you should get a stacktrace that looks like the output below. I snipped a fair bit of stacktrace and replaced it with [blah blah blah]. I did that because that's what I mentally do as well, I look for the last line that includes a file that I've created and I ignore everything after a few lines below my line. That is my first recommendation - If you see a stacktrace, it's likely that the problem is in your code, not Clojure. Look for the last line of your code (N) and ignore every line below N + 3. When I read the above line I see the problem is in namespace 'reading-clojure-stacktraces/core', in the function '-main', in the file core.clj, on line 6. I'm no Clojure internals expert, but I believe Clojure actually creates a class named reading_clojure_stacktraces.core$_main with an 'invoke' method; however, I truthfully don't know (and you wont need to either). Whether a class is created or not, it makes sense that the line will need to be formatted to fit a valid Java class name - which explains why our dashes have been converted to underscores. Moving up another line, I can see that the issue is likely inside the 'foo' function of the reading-clojure-stacktraces namespace. A quick review of the original code shows that line 3 of core.clj contains the call to throw, and everything makes perfect sense. If all Clojure stacktraces were this simple, I probably wouldn't bother with this blog entry; however, things can become a bit more complicated as you introduce anonymous functions. The following snippet of code removes the 'foo' function and throws an exception from within an anonymous function. Another trip to 'lein run' produces the following output. The above stacktrace does give you the correct file and line number of where the issue originates; however, you'll notice that the function that threw the exception has become a bit less easy to identify. My use of an anonymous function led to Clojure naming the function fn__9, and there's nothing wrong with that. In fact, this example is especially readable as the stacktrace shows that fn__9 was created inside the -main function. I expect you'd be able to find the issue with our contrived example without any further help; however, production code (often making use of high order functions) can lead to significantly more complex stacktraces. You could forsake anonymous functions, but there's a nice middle ground that is also helpful for debugging - temporarily name your anonymous functions. Clojure's reader transforms the Anonymous function literal in the following way. Therefore, the following code will be the same as the example above, from Clojure's perspective. Another quick 'lein run' verifies that the stacktrace is the same (and I see no reason to repeat it here). However, now that we've switched to fn, we can provide a (rarely used, optional) name. At this point, 'lein run' should produce the following output. Now our line contains a bit more information. The two $ signs still indicate that the function with an issue is a function created inside -main; however, our stacktrace also includes the name (in bold) we specified for our function. You can use any valid symbol characters, so feel free to put anything you want in the name while you're debugging. note: Symbols begin with a non-numeric character and can contain alphanumeric characters and *, +, !, -, _, and ? -- clojure.org. So far, all of the examples have been somewhat noisy, but mildly easy to mentally filter. Unfortunately, idiomatic Clojure code can also lead to stacktraces that bounce back and forth between your code and the standard library, leaving you to sift through significantly longer stacktraces. The following snippet of code throws a NullPointerException due to a mistake I clearly made, but the last line of 'my code' is in the lower half of a long stacktrace. The above example code produces the below stacktrace. In situations like these, I generally look at the top few lines to get a bit of context, and then I scroll down to find the last line of 'my code'. Looking at the top 4 lines from the stacktrace I can see that the issue is with the inc function, which was passed to the high order function named map. If I look father down the stacktrace, I can see that line 7 in reading-clojure-stacktraces.core is where the issue began in 'my code'. If you look at line 7 of (reading-clojure-stacktraces) core.clj, you'll notice that I'm merely printing the results of calling foo - yet the issue seems to be with the map function that is invoked within foo. This is because map is lazy, and the evaluation is deferred until we attempt to print the results of mapping inc. While it's not exactly obvious, the stacktrace does contain all the hints we need to find the issue. Line 3 lets us know that inc is getting a nil. Line 4 lets us know that it's happening inside a map. Line 5 lets us know that we're dealing with laziness. And, the line containing our namespace lets us know where to begin looking. The following example is very similar; however, it uses a partial to achieve the same result. Again, you'll want to skim the stacktrace for hints. In the above stacktrace we can see that line 3 is telling us that + is the issue. Line 7 lets us know that partial was used. And, the remaining hints are the same as the previous example. Skimming for hints may look painful at first. However, you quickly learn to filter out the common Clojure related noise. For example, anything that starts with 'clojure' and looks like a standard Java class name is highly unlikely to be where a problem exists. For example, clojure.lang.Numbers.ops isn't likely to have a bug. Likewise, you'll often see the same classes and methods repeated across all possible errors - clojure.lang.AFn, clojure.lang.RestFn, clojure.core$apply, clojure.lang.LazySeq, clojure.lang.RT, clojure.lang.MultiFn, etc, etc. These functions are often used building blocks for almost everything Clojure does. Those lines provide a bit of signal, but (for the most part) can safely be ignored. Again, it can be a bit annoying to deal with Clojure stacktraces when getting started; however, if you take the time to understand which lines are signal and which lines are noise, then they become helpful debugging tools. related: If you want a testing library that helps you filter some of the stacktrace noise, you might want to check out expectations. A REPL is a powerful tool. I use the REPL extensively in development, and I recently added a web REPL to each of our production applications. A production REPL is not for the faint of heart. I wouldn't add a REPL to production in 95% of the projects I've been a part of; however, I'm currently working with two other developers that I completely trust with the power of a production REPL. As a simple rule, I wouldn't give access to a production REPL to anyone that doesn't also have root access to the server - if you can't be trusted with one, it's likely that you can't be trusted with the other. However, if you can be trusted, I'd rather you have all of your tools available to you. Don't get the wrong impression, I'm not regularly redefining functions in production. I rarely use a prod REPL, but when I do, I almost always use it to read reference data. On the very rare occasion, I'll wrap an existing function with a new version that logs the value of the incoming arguments. In short, I use the prod REPL (again, sparingly) to gather more data, not to fix outstanding bugs. I'm not saying I would never use it to fix a bug, but that would be an extremely exceptional case. 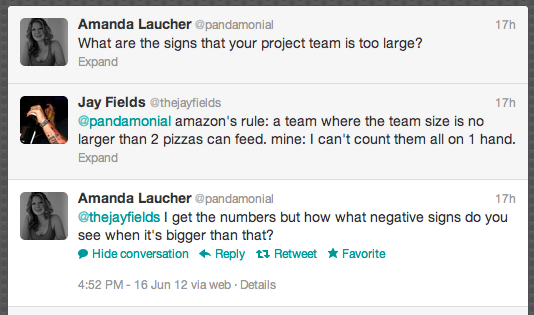 Amanda Laucher recently queried the twitterverse on the topic of team size. In my opinion, my last project team was "too large". This blog entry will focus on the things that happened that drove me to that conclusion. note: I was the only person on the team who believed it was too large. The rest of the team thought we 'might' be too large, and the cost of making a change was greater than the pain of remaining 'potentially' too large. Since I was the minority, it's safe to assume that my opinion is controversial at a minimum. In many ways my last project was a very, very well funded start-up. We started small, with 3 developers; however, as the scope of our problem grew so went the size of our team. When the team had reached 7 (5 developers in one office and 2 in another), I began to advocate for a team split. By the time we reached 10 total, I was positive that a split was appropriate. As I stated, we were in start-up mode. I wanted to deliver as fast as possible and I felt that several factors were impacting our ability to produce. Camps. Technology choices originally drove my desire to split the team. The project had speed requirements that forced the use of Java for some portions of our solution; however, other portions of the codebase could have been written using Java, Clojure, or even Ruby. I held the opinion that anything that could be written in Clojure should be written in Clojure. I felt faster writing code in Clojure (vs Java) and I wanted to deliver as fast as I possibly could. Two of my colleagues agreed with my opinion, 2 abstained, and 2 strongly disagreed with me. The two that disagreed with me thought it was easier to write everything in one language, using one toolset. I completely see their point of view, and acknowledge all of their opinions. They are not wrong, we just have incompatible opinions on software. I need to be clear here, these were good developers. It would have been easy if they were inferior developers - we would have improved their skills or found them a new home. However, that wasn't the case. These were guys that consistently delivered as much, if not more value than I did - they just wanted to get things done is a way that clashed with my approach. The team was more or less split into 2 camps - pro Clojure and pro Java. Countless hours were spent discussing how to deal with this difference of opinions. Retrospectives were often composed of 2 types of problems: Problems that we all agreed on and solved, and problems that we would never agree on and never solved. The 2nd types of problems appeared at every retrospective and always led to the same interaction. people from my camp agreed that it was an issue, and spoke in generic terms (not wanting to target or alienate anyone). people from the opposing camp made their (completely valid) points. This situation infuriated me, but, realistically, there was never going to be a solution that made the entire team happy. Everything that was written in Clojure annoyed the pro Java camp, and anything that wasn't performance sensitive and was written in Java annoyed the pro Clojure camp. I naively believed that the pro Java guys would "see the light", and tried everything I could think of to convince them that Clojure was the right choice - and it was for me, but it (likely) never will be for them. In the end, I decided that advocating Clojure was a waste of time and focused my efforts on getting the team split by compatible opinions. I think your points about non-compatible opinions on a team, in the saddest case, can occur on a team of two. Do you suppose two distinct camps (as opposed to a bickering mob) become more likely as team size grows? I do believe it is more likely that camps occur as the team sizes grow. I believe disagreements are healthy; however, camps are counterproductive - due to too much time spent in arbitration. I do agree that you can have camps on a team size two, and it's possible to have no camps on a team of size 10 - which is why I don't think size X will guarantee camps, but that if you have camps then X might be too many. If your team has camps with incompatible (yet, perfectly valid) opinions then it's a sign that it's possibly too big, or it has members that would be more effectively used if swapped with someone else in the organization that holds compatible opinions. Or, more precisely, if you have camps (where camp is defined as N or more people) with conflicting opinions, and you have a solution that can be split vertically or horizontally, then your team size may be "too big" - where too big is defined as "a split would likely increase the productivity of the members of both camps". It could be possible to replace X split-away members with Y new members where (Y > X) and as long as you do not have camps, the team would not be considered too big - which is why you cannot simply state that Z people on a team is 'too big'. note: N is defined as the number of people required to reasonably address bus risk. On a highly functional team with almost no turnover, N can equal 2. More often, N will be 3 or more. Depth Shortage. Agile Enthusiasts loved to point out the benefits of Collective Code Ownership - and they are undeniable when contrasted with Strong Code Ownership. However, I believe that Collective Code Ownership actually hindered the delivery pace of the previously referenced development team. Collective Code Ownership combined with our team size resulted in many team members having breadth of knowledge, but lacking depth of knowledge of the system. Do you believe that CCO hindered the pace of delivery, or that the code base grew to a size and level of complication that made it hard to own collectively? Definitely the latter. Our problem had grown to a size that caused CCO to go from a positive impact to a negative one. This was not due to a flaw in CCO, this was due to applying CCO to a situation where it was no longer the most effective choice. The problem we were solving had 3rd party, distributed system, compliance, extreme performance, and algorithmic concerns that all needed attention. On the surface it didn't seem like a tough problem to solve, and yet, not a single member of the best team I've ever worked on could explain the entire problem. In short, it wasn't just complicated, it was deceptively complicated - which made matters worse. The problem was large, and we attempted to tackle it (clearly, not intentionally) by building a team that was too large. After a year of practicing Collective Code Ownership I found that most areas of the codebase would have a primary person who deeply understood it's purpose, and almost everyone else knew very, very little about it. Those with shallow knowledge could successfully edit a method, but a change of greater size would require pairing with the primary person. The problem was large, and we were spread too thin. The application was already split into logical components, and my solution was to move to a Weak Code Ownership model - with the requirement that each component would have at least 3 "owners" that deeply understood each component. You would still be required to know what each component did, but you wouldn't ever be required to even look at the code for that component. I believe this solution would have solved our depth issue, but so would breaking up our large team. If your team is so large that working in every area of the codebase results in shallow knowledge of over 40% of your codebase, that might be a sign that you could benefit from splitting the team into smaller groups with more specific responsibilities. And, just in case you are wondering, pairing isn't the solution to having a team that is too big. I'd like to thank the following people for reviewing and providing feedback on this entry: J. B. Rainsberger, Peter Royal, Nick Drew, Mike Rettig, John Hume, Clinton Begin, Pat Kua, Nat Pryce, Patrick Farley, & Dan North. Trust plays a very important role at speakerconf. speakerconf is known as a place where you can be honest without fear of repercussions. Every year we have several presentations that are confidential, and those are often some of the most interesting presentations. Josh and I have made several decisions that encourage a high level of trust, and this blog entry describes those choices. Josh and I don't tend to keep people we can't trust within our networks. Therefore, when we began inviting people to speakerconf we already knew we were assembling a group of people that could be honest with each other. I believe the speakers had mutual trust with Josh and I, and that trust was easily extended to other people that Josh and I trusted. After the first year we started inviting people using a simple rule: 75% of all invites will go to alumni. speakerconf alumni will already have existing relationships with other alumni, and they'll be more willing to share - due to their previous experiences at speakerconf. We always want new people and fresh ideas at speakerconf, but we don't want to lower the trust level by throwing in a larger group of people who haven't yet built strong relationships. We've experimented with inviting less alumni and never been happy with the results. For speakerconf 75% seems to be the magic number. These days, Josh and I only invite new people to speakerconf based on alumni recommendations. Alumni recommendations are often for people from various backgrounds; which is perfect, as Josh and I prefer to have presenters with diverse experiences. I believe the key to embracing diversity while not compromising on trust is to focus on presenters that have mutual respect for each other despite their backgrounds. Every speakerconf begins with a meet & greet networking session. This session is usually at a hotel lounge area, and it's only purpose is for each of the speakers to get a chance to meet each other. Following the meet & greet, everyone is invited to an "unoffical" dinner. It's not required or covered by the conference, but it allows people to continue to get to know each other, if they like. Very rarely do any presenters skip this opening dinner. During both the dinners and the open discussions we provide conference sponsored drinks - to get the honest discussions flowing. I'll be honest, when I'm stone cold sober I can be a bit shy. I get the impression that other speakers sometimes share this personality trait. The open discussions do often begin a bit timidly; however, after a round or two we quickly move to pulling no punches and diving head first into whatever interests us the most. At speakerconf, we don't even provide the option to record your talks. It would be great if we had some material that we could put on line for the rest of the community to benefit from, but we're not willing to sacrifice any level of honesty for the sake of information sharing. We've surveyed the presenters and they've unanimously agreed that they do not want their presentations to be recorded, and they would likely change what they said simply if a camera were present in the meeting room. It's obvious, but we also remind everyone that if their presentation contains any sensitive information then they should begin by asking the audience not to repeat anything from the presentation. Also, at the beginning of every speakerconf we ask all the speakers to refrain from repeating (e.g. tweeting) any information without first consulting the source of the information. We don't wear nametags at speakerconf, and we don't go around the room and introduce ourselves. I personally hate nametags, and we found the introduction-go-around to be a bit dry and awkward. Instead, before every presenter speaks, Josh stands up and provides several facts about a person, and a single lie. It's up to the audience to decide which statements are which, though it's generally obvious due to the lie being the statement that caused everyone to laugh. It's fun, and turns the traditional awkward introduction into something you look forward to at the beginning of each presentation. We don't officially organize seating for lunch or dinner at speakerconf, but we do encourage people to rotate who they sit with while they're dining. We found that the level of trust goes up greatly after you've taken the time to break bread with someone, and we want to encourage that trust building in anyway possible. Like I said, we don't organize anything specific here, we just lead by example; we try to pick our company for our next meal based on who we've spent the least amount of time with. That's about all we do. There's nothing revolutionary about our methods; however, the result is an environment where trust goes a long way towards helping a presentation reach it's full potential. The 'name' function is a clojure function that returns the string for a keyword, symbol, or string. At first glace this might not seem that interesting; however, it's good to know 'name' if you've ever been surprised by (str :foo) => ":foo". If you have a ruby background (as I do), you probably expected the result to be "foo", spent a bit of time looking, and found that (name :foo) was actually what you were looking for. At this point, speakerconf has run 5 times in 4 years - in Aruba and Italy. Josh and I are happy with what we've created, and a few follow up entires will list the attributes of speakerconf that make it a unique and successful event. This post, however, should serve as a quick view into what a typical day is like at speakerconf. Each day begins unofficially at breakfast. There's no assigned meeting time, but people generally start appearing around 9:00am. There are no assigned tables, and people usually just break off into small, ad hoc groups of 3 or 4. It's rare to find one of these tables not talking about what interested them from the day before, or what they're looking forward to discussing that day. Following breakfast, people begin filling into the conference room, and presentations begin at 10:00am sharp. Each presentation generally takes between 10 and 30 minutes. There's usually a ton of questions that go with each presentation, thus the variable talk time-slot. We attempt to get 4 presentations done each morning, and usually end up leaving 'late' for lunch. Lunch generally lasts an hour, and is done at one of the local restaurants (not in the conference room). Attendees break into small groups and go to different restaurants. Most often, people go to lunch with someone they want to discuss a specific idea with, or someone they haven't previously dined with. After lunch everyone makes their way back to the conference room for 4 more presentations. On a good day, we'll be done with presentations by 3pm; however, (due to the q&a for each presentation) we're usually done with presentations between 3:30pm and 4:00pm. Once the presentations end we move out of the conference room and into a space that allows us to have many smaller discussions. The split is ad hoc once again, and, just like lunch, is often based on digging further into a presented topic or meeting a new person. These discussions often begin with most of the presenters in attendance, and people only seem to leave if they have personal or business matters to attend to. These smaller discussions end (or rather, are put on hold) at 6:45pm at the latest. Dinner is always at a local restaurant (outside of the hotel), and usually begins around 7:00pm. Just like every other meal, attendees break up into unassigned, smaller groups of 3-6 people. Dinners are usually at least 3 courses, and offer plenty of time to dig deep into whatever subject drove you to select your dinner companions. Once dinner is complete everyone heads back to the hotel, and those that still have the energy to have further discussions generally make their way to the hotel bar. It's not uncommon for those that have already completed their presentations to stay out past 2am - and still get themselves to the 9:00am breakfast the following morning. That's a pretty typical day at speakerconf. If it doesn't sound exhausting, then I haven't done a very good job of describing it. However, it's equally exhausting as it is inspiring, and the days at speakerconf are some of my favorite days of the year.